~¼ cup cream or milk to thin out if desired. My need more if using as salad dressing, less if using as a vegetable dip. 1. In a bowl, crumble the cheese (if not already). Add Mayo, Sour cream, garlic, herbs, onions. Stir to combine. OR put all in a food processor and pulse to desired consistency. 2. If too thick, add cream/milk in 1TBS quantities until you reach desired consistency. 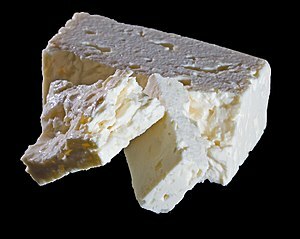 Salt is not required as the feta has salt and should season the dip nicely. If you want, add more, but not after everything is mixed together and tasted first. This is best made the day before to let the flavors really meld. At least, should be a couple of hours in advance. Always taste before serving and adjust seasoning if needed. Go light on the salt. Posted by culinaryease on December 2, 2010 in Cooking for two or less, General Cooking, Parties, Appetizers, and More, Recipes and tagged dips, dressings, entertaining, Feta.